Recall notice: most Diono convertibles, including the Radian RXT, were recalled in October 2017. See recall details here. 2018 Diono Radian RXT models currently for sale have revised (lower) weight limits and other modifications so this review only applies to RXT models manufactured before the October recall. Updated review is coming soon. The Diono Radian RXT fills a niche for parents and caregivers looking for a narrow carseat that can hold a big kid. The Radian line of seats is known for being 3-across friendly—when you have a tiny back seat, these are the carseats you generally look at first. The Radian R-series, the R100, R120, and Radian RXT, all have basically the same shell design but features distinguish them from each other. Diono discontinued the R100 and R120 in September 2018 and refreshed the carseats in the form of the 3 R and 3RX. This review will focus on the previous version of the RXT, but the information is similar for all the Radians and we have a review of the new 3 RXT forthcoming. *models manufactured prior to 9/5/17 have a forward-facing weight limit of 20-80 lbs. One of the narrowest convertibles on the market: makes a 3-across much easier! Installation of the Radian is either easy or hard; there doesn’t seem to be a middle ground with this carseat. 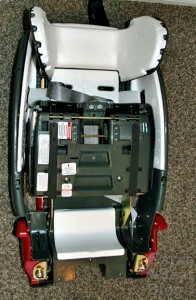 In order to install the Radian rear-facing, you must first attach the rear-facing base/boot. That base will set the recline for you automatically—you will not need any rolled towels or noodles to achieve a proper angle. In fact, Diono does not allow the use of rolled towels or noodles with Radians. For an older child who has good head control and can sit upright unassisted, the Angle Adjuster accessory can be used under a rear-facing Radian to make it more upright and give front seat passengers inches more legroom too. The RF belt path is a closed belt path, meaning it’s enclosed in plastic. If you’ve got big hands, you’ll have trouble fitting the seat belt or SuperLATCH belt through the belt path; I’ve got average-sized hands and have trouble. Because it’s closed, tightening the belt for a tight installation is difficult too. The best way to get a carseat tight is to pull the belt in the same direction as the belt path, but with a closed belt path, you can’t. You’ll eventually get it tight—it takes you longer to do so. Installing the Radian forward-facing is easier than RF because the cover can be pulled away for access to the FF belt path. 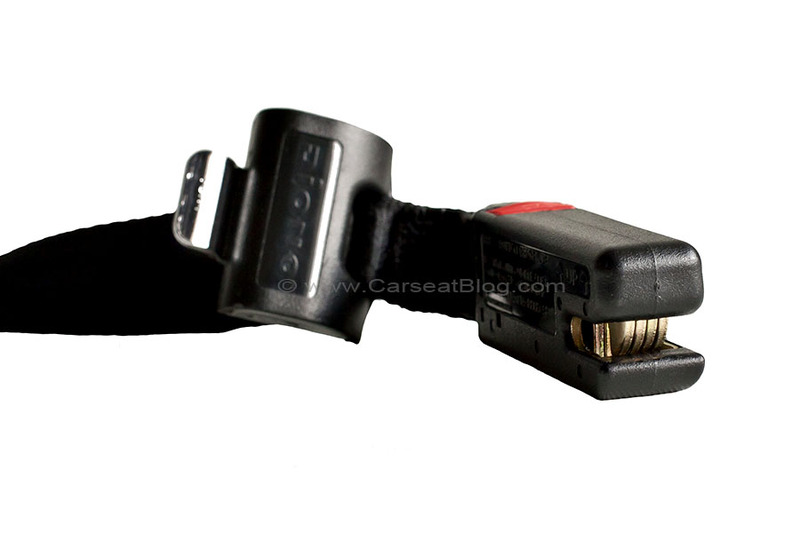 Vehicle buckles that are on short buckle stalks or that are even with the vehicle seat may cause concern because the seat belt will bunch in the latchplate the tighter you pull. This is normal for this carseat. Adjustable Bottom: When installing the Radian forward-facing, models manufactured after May 2016 require that the forward-facing adjustable bottom be lowered, but only if the child is over 25 lbs. Most forward-facing children will be over 25 lbs., so that means you should lower it before installing the Radian FF. Models manufactured before May 2016 have the option of using it, but it increases your chances of a successful FF install. 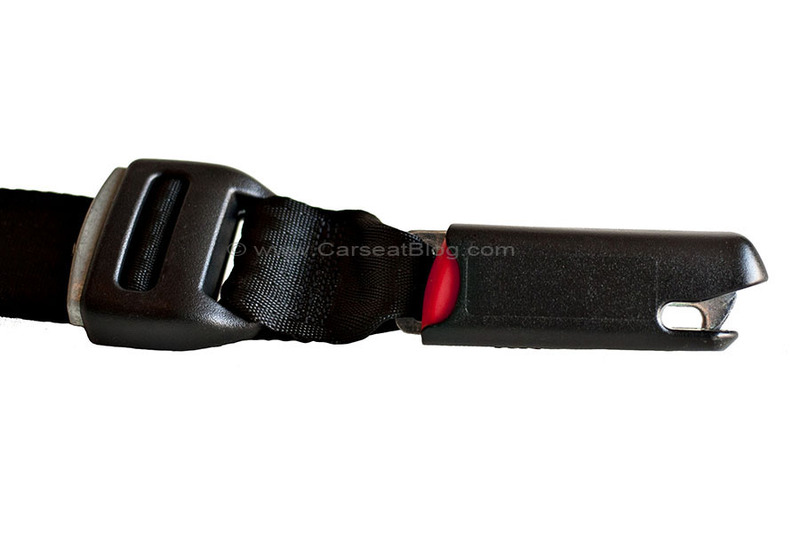 Safe Stop Load Limiter: This small strap that is attached to the back left of the carseat when you first receive your Radian is called a load limiter. Its purpose is to increase the amount of time over which your child feels crash forces. If you install the Radian FF for a child who weighs under 40 lbs., you must use the Safe Stop. The Safe Stop is never used rear-facing. The SuperLATCH connectors are the deluxe push-on style connectors, but the connectors are beefier with 4 attachment “pawls” instead of the standard 1 pawl. There is an adjuster on one side of this strap. There are storage areas at the top of the shell to store the LATCH and top tether connectors when not in use. The tether strap can be used rear- or forward-facing. 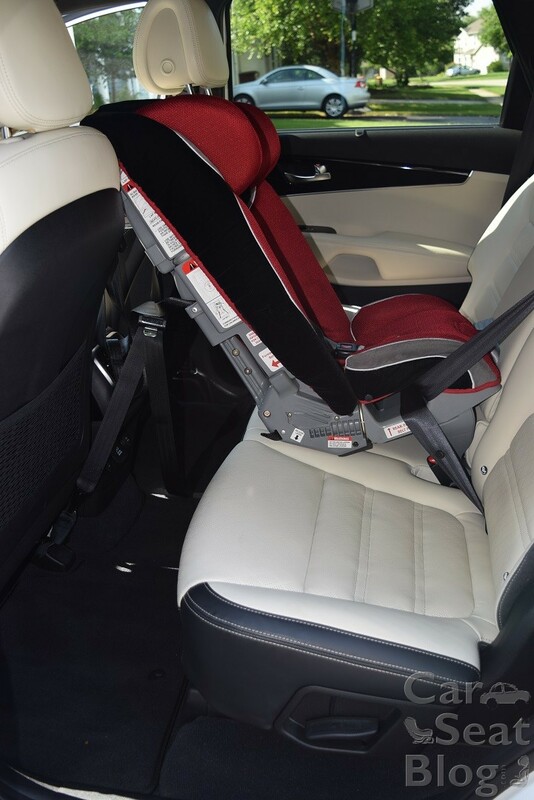 While tethering a forward-facing child restraint with a harness is always recommended, a top tether is not required for this seat. Once your child reaches the weight limits for SuperLATCH, switch to the vehicle seat belt for installation, whether rear- or forward-facing. When the carseat is used as a booster, however, it may be LATCHed in at any weight. 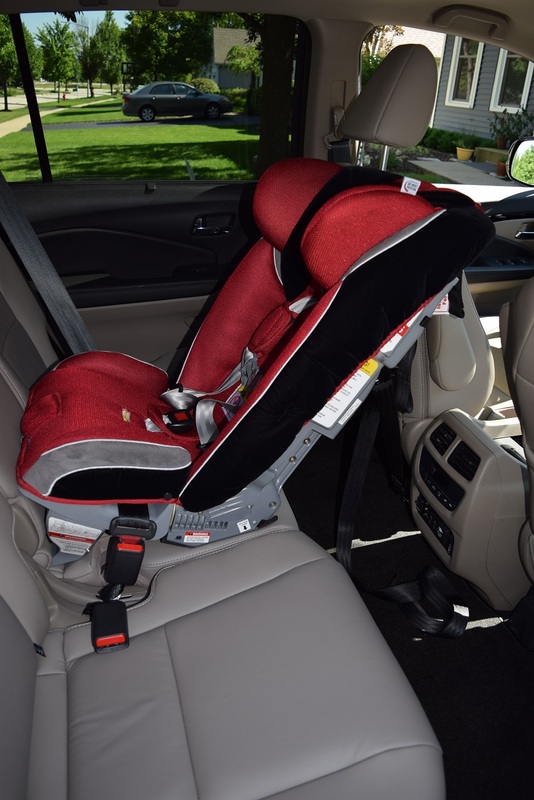 This is because the LATCH is simply holding the carseat to the vehicle while the seatbelt is restraining the child and will be the device taking crash forces. Diono allows LATCH installation in the center seating position if the vehicle manufacturer allows it and the LATCH anchor bars are spaced 11-14” apart. 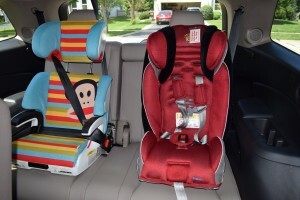 Diono has determined that the Radian carseats can be installed with inflatable seat belts found in Ford Motor Vehicles. This does not include Mercedes vehicles or inflatable seat belts found on aircraft. The Radian RXT comes with an infant head pillow and body support. These items are optional and you can remove them at any time. The Radian also comes with 2 sets of harness pads: a memory foam-padded set that Velcro around the chest clip and a much longer set that are rubberized on the back with metal slides on the end. 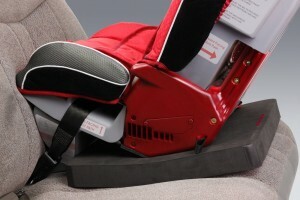 The shorter harness pads MUST be used forward-facing for children under 65 lbs. (optional for rear-facing). The longer, rubberized set MUST be used forward-facing for children over 65 lbs. Because of the well-padded cover and memory foam in the seating area, the Radian is a comfortable carseat. It won’t fit small newborns well, even with the body support, because the bottom harness slots are too high. 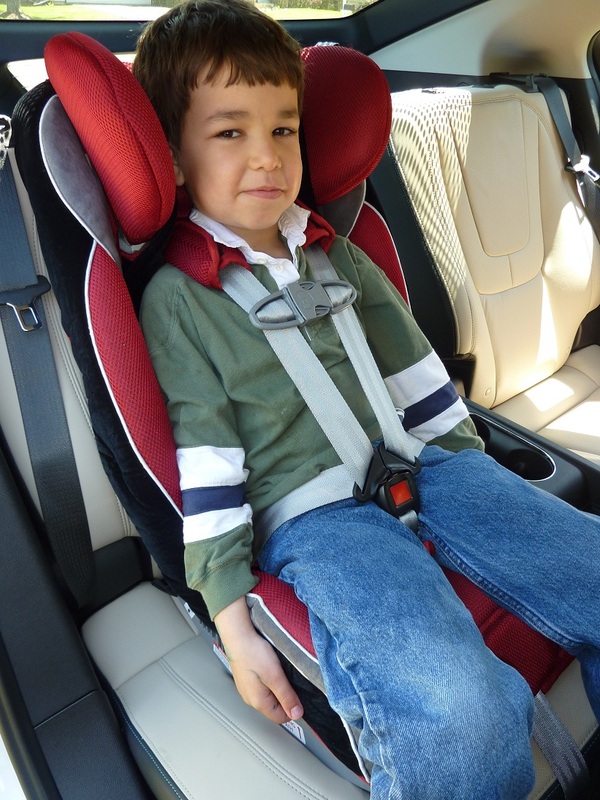 Most kids make it easily to belt-positioning booster seat age in the harness. The headrest provides just enough support to be comfy without getting in the way. When the Radian RXT is rear-facing and the child is using either of the bottom 2 harness slots, the headrest must be moved to the top-most position. 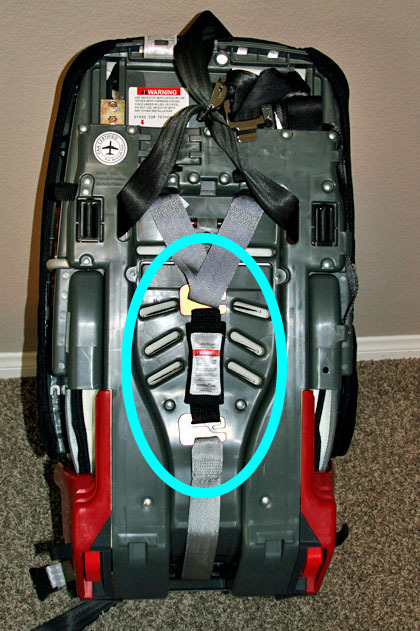 When used as a booster, the shoulder belt has a tendency to get caught in the shoulder belt guide. This is more pronounced in older versions of the RXT and Diono has tried to fix this problem in the latest update. 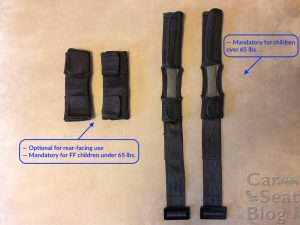 It’s a serious problem when the shoulder belt gets caught in the belt guide because if a child leans forward and the shoulder belt doesn’t retract automatically, it stays loose and floppy on the child and could lead to the child being severely injured in a crash. 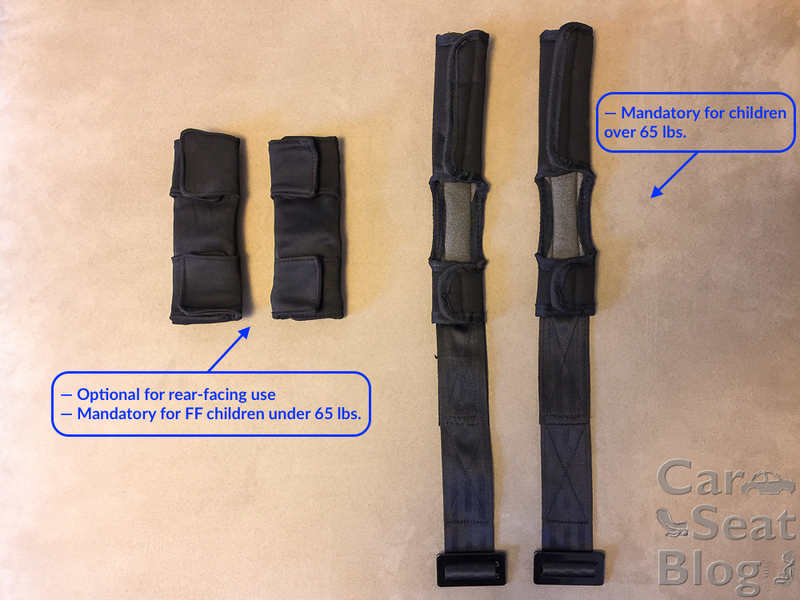 The belt fit and geometry is otherwise very good and even earns it an IIHS Best Bet rating as a booster, but the IIHS doesn’t measure booster fit with real, moving kids. The cover is well-padded with a comfortable texture. Diono recommends hand washing or a front loader washing machine. Definitely hand wash the memory foam! Line dry. The harness adjuster tightens with a tug-tug-tug motion that may take some getting used to by some caregivers. The harness height adjusts from the back of the seat. Each strap is removed from the metal splitter plate and rethreaded through the correct harness slot. Use the slots at or below the shoulders for rear-facing, above for forward-facing. Children whose shoulders are above the top harness slots, yet still weigh less than the maximum forward-facing harness weight limit, may continue to use the carseat. For those children, the tops of their ears must be below the top of the carseat. The RXT is FAA-approved for use in aircraft. 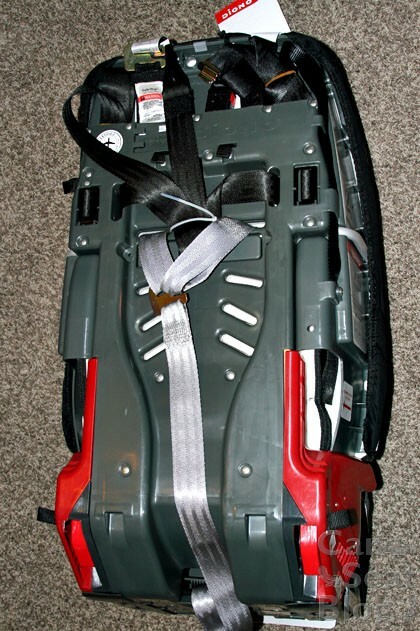 It also is a heavy restraint weighing in at 26.5 lbs., so if you do travel with it, you’ll want to use a luggage cart to avoid having to carry it. The RXT does come with a padded shoulder strap for carrying and I suggest buying another to be able to carry it backpack-style if you intend to carry it. Since the Radian seats are some of the narrowest on the market, you won’t have any problems fitting one in a plane seat AND the tray table will be able to come all the way down for a forward-facer. For rear-facing, the Angle Adjuster may make the seat fit depending on the pitch of the seats on the plane your flying. Buying a snack for the person in front of the carseat certainly doesn’t hurt ;). Remember that it can only be used with the harness on the plane since belt-positioning booster seats can’t be used on planes. Radians manufactured before May 2016 have expiration dates of 8 years as harnessed seats, 10 years as belt-positioning boosters. Radians manufactured as of May 2016 and newer have 10 year expirations from date of purchase (or DOM if you didn’t save your receipt). Diono recommends replacement after any crash. 3 Crotch Strap Positions: Having a choice of crotch strap positions makes the harness more comfortable for bigger kids. Low and narrow footprint means it’s more likely to fit in tight spots. Padded Cover: A thickly padded cover, plus the memory foam in the bum area, makes for a comfy seat. Harness Adjuster: It’s tug-tug-tug can be frustrating for some used to a smooth adjuster on an infant seat. Installation: Often more difficult depending on the vehicle, with a higher learning curve due to the various features. Snug fit of the shoulder belt in booster mode is poor; shoulder belt can get caught leaving slack. 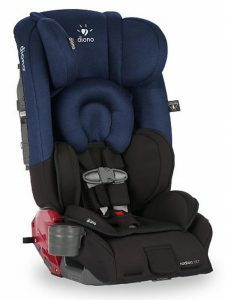 The Diono Radian RXT is a solid convertible seat with great rear-facing features. Its high height and weight limits accommodate big kids both rear- and forward-facing, yet it takes up less space than many of its competitors. For narrow backseats or 3-across situations, you simply can’t beat the width of the RXT. Features like rear-facing tethering, thick padding, and solid construction make the Radian RXT a solid purchase. Thank you to Diono for supplying the RXT used in this review! Hi Barb. If you have a newer Rainier with the full fabric cover, there isn’t a belt guide since it doesn’t convert to a booster. 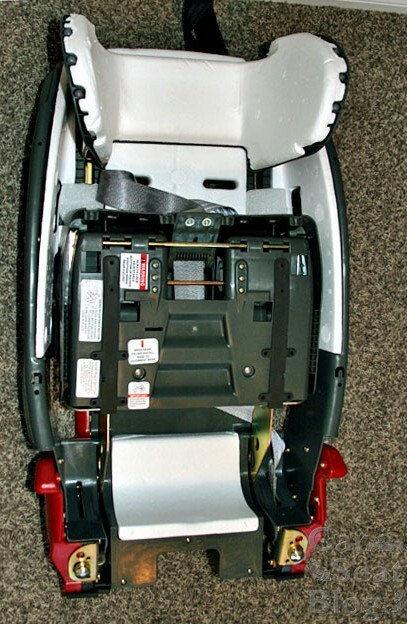 If yours converts to a booster, it’s a black plastic “slide” with a red sticker; we have a close-up pic here: https://carseatblog.com/29939/diono-rainier-review-diono-adds-depth-to-its-convertible-lineup/. I have the diono rxt for about a year. I’ve noticed that I can pull apart the chest buckle after closing it with very little ease. My 3yo’s will probably be strong enough to do this themselves by next year I assume. Is this a default? It definitely doesn’t seem strong enough to hold in the instance of impact velocity. Sarah, it shouldn’t be that easy to pull apart. Please contact Diono to see what they suggest doing. Have so much belt pulled out to get the harness tight? We have this diono 3 txt for our 7 month old and it just seems I had to pull and pull and pull and now there is this long belt between her feet. Hi Chelsea. As long as the harness is snug on your daughter, then it’s fine. It’s long to accommodate bigger kids as they grow. One of my children is in a Radian R120. We just got a Radian RXT for the two other children, but one of them hates hates HATES the headwings. Is it at all possible to have them removed? Or do I need to return the Radian RXT and get a Radian 120 instead? No, there’s no way to remove the headwings. What about switching the RXT with the R120 you already have? I can’t find the answer to this anywhere…. we need to switch our 5 yo (42lbs) to a booster. Any idea why the Radian RXT is a 50lb minimum for a booster? With the money we invested, I’d rather not buy a new/different booster if I don’t have to. Hi Leah. Diono put the 50 lbs. minimum to keep younger kids from using the RXT in booster mode too soon. Is your child over the height limits? 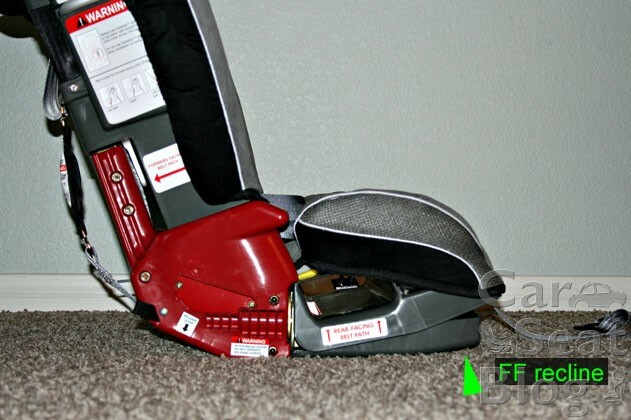 While you don’t want to purchase a different booster, we do have serious reservations about its use as a belt-positioning booster seat because the shoulder belt gets caught in the belt guide and can stay loose. We have a video showing this problem in the Rainier review, but it also applies to the RXT: https://carseatblog.com/29939/diono-rainier-review-diono-adds-depth-to-its-convertible-lineup/. Oh awesome, Kristine! So glad we could help! My question is regarding 3 car seats in the third row. The 2 end seats have latch connectors but the middle seat has a seat belt that comes from the roof of the car, is this acceptable” I have a 2016 Honda Odyssey. I also have 2 car seats installed in the second row but am unable to put the 3rd one there as I would not have access to load & unload the kids in the 3rd row. Please advise. One worried Grandma with 5 little grand kids. Hi Kathie. 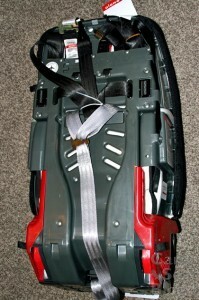 Seat belts that come from the roof are totally safe to use to install carseats. It may be a little more challenging to get the carseat tight, but it’s doable. It does sound like you’ll have to put 3 in the back row and 2 in the 2nd row to make everyone fit. I bought 2 of these cuz they store easily in our NYC apt, appear to be very safe, are comfy and (technically) allow for someone to sit between my 2 kids in the backseat. We do not own a car, so use these in rentals, careshares, borrows, etc… I’ve learned how to install them well enough, but the big problem is uninstalling. Of course, I want to use the top tether for max security. In multiple vehicles though, the release for the top tether wound up sandwiched btwn the back of the carseat and the seat it was installed in. Because it is attached to the seat end of the tether, once it is pulled tight, the release is basically inaccessible. One time I had to wedge a screwdriver in behind the carseat to reach the release. Why in the world wouldn’t the release be on the other end of the tether, next to the hook, where it could be easily reached for uninstallation? Am I missing something? Thanks for you great blog! Hi Keith. You’re not missing anything, it’s a design mystery. Thanks for your kind comment! We have a 2015 Radian RXT. Is it normal to have to push up the headwings on a daily basis? Also I am wondering if the height limit is 57″ for forward facing harnessed where should the child’s head be in comparison to the head wings. My little ones (twins) are five years old and 49″ but I feel that their heads are right at the top of the head wings. Is there a seated height limit that I’m not seeing? Kara, the forward-facing height limit for the Radians is so arbitrary because no child will actually fit in the seat at 57″. As long as the tops of the ears are below the top of the wings and the shoulders are at or below the top harness slots, the child still fits in the carseat. 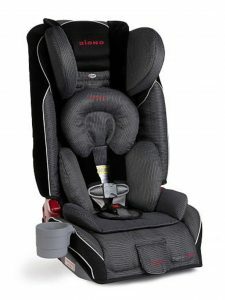 Diono does allow the child’s shoulders to go slightly above the top harness slots, so it’s up to you if you want to follow standard carseat advice or the carseat manual on this one. Having shoulders at or below the top harness slots is slightly more conservative advice. For the headwings, there are nuts you can tighten inside to keep them from falling down so often. Remove the cover and you’ll see them. Love this review! Can you tell me if there is a depth gap between the head rest foam and the back foam? 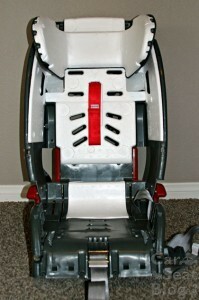 I currently have a Graco 4EVER but my DDs head is pushed forward by the foam on the headrest. I’m desperately looking for an alternative. Hi Tiffany. The headwings on the RXT are on the sides only, so they don’t push a child’s head forward at all. Here’s the link to the crash tests I was referencing. Hi Danielle. I question anyone who does crash tests that isn’t a carseat engineer or other highly trained individual interpreting the data. The RXT review she has is pretty similar to my experiences with it. It’s a niche seat that can be fussy to install. I wouldn’t recommend the Triumph at all for a 5 yr old (I’m always afraid I’m going to break that seat when I install one). If the Radian ends up being too difficult for you, think about a Harmony Defender, which would last longer for your daughter, or a Graco Tranzitions (hit or miss too). Another brand new option would be the Cosco Finale. We don’t have a review yet on that one, but it’s a bare bones seat at WM and Target. 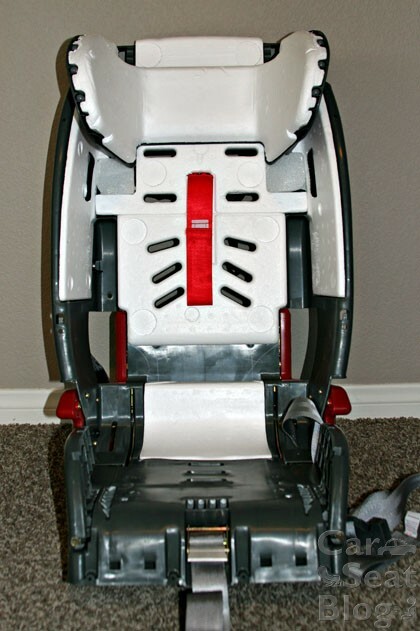 Do you know if the latest model of the RXT has improved the booster seat? Fiona, Diono has removed some of the padding/fabric from the area around the shoulder belt guide, but I still feel like it impedes the shoulder belt retracting into the retractor, at least in my vehicles. This may be a situation where you buy the seat expecting to use it as a convertible and if it works as a booster, it’s a bonus! 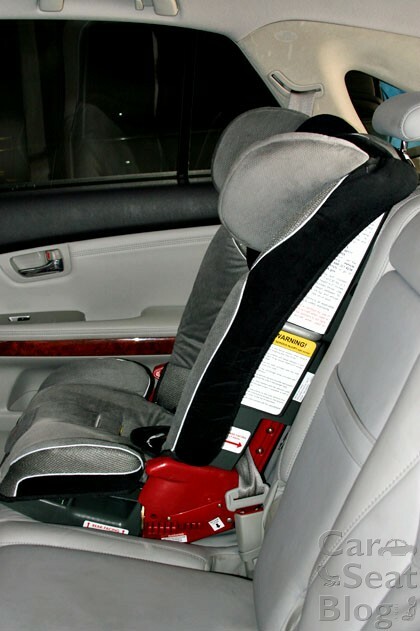 You must read your carseat and vehicle owner's manual and understand any relevant state laws. These are the rules you must follow to restrain your children safely. All opinions at CarseatBlog are those of the individual author for informational purposes only, and do not necessarily reflect any policy or position of Carseat Media LLC. CarseatBlog makes no representations as to accuracy, completeness, currentness, suitability, or validity of any information on this site and will not be liable for any errors, omissions, or delays in this information or any losses, injuries, or damages arising from its display or use. All information is provided on an as-is basis for readers in the USA and Canada.